Budapest – Hundreds of enthusiastic volunteers took part in the sixth edition of the nature conservation volunteer event PET Cup, aimed at cleaning up the Tisza River. 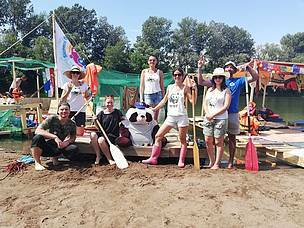 WWF-Hungary joined the race again with River Panda, our recycled boat. This time a small team from WWF-Ukraine also joined the panda crew on the Tisza. The competition showcases custom built boats made of recycled PET bottles that are used to clean the river’s floodplain and promote environmental awareness. The boats have to meet a number of requirements, such as using only use renewable energy like paddles or sails. 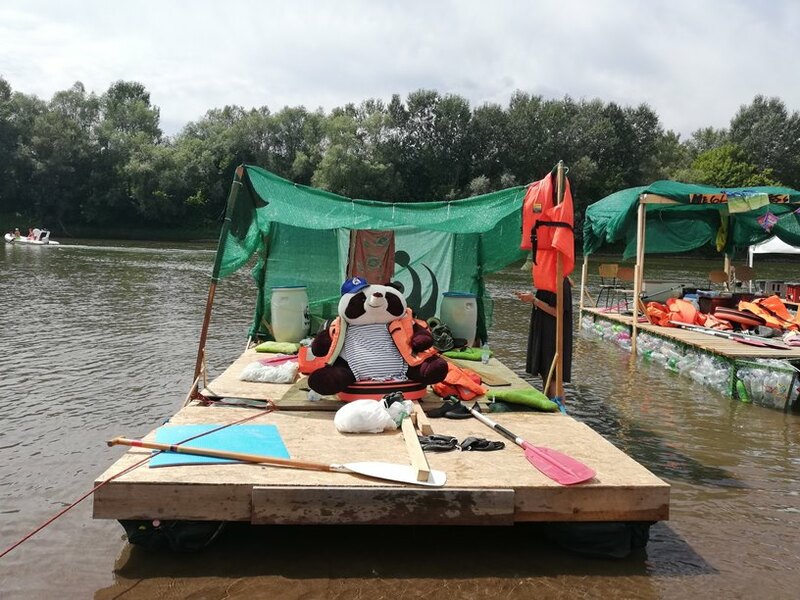 During the one week of the PET Cup the boats floated 70+ river kilometers, while volunteers on board removed 10 tons of plastic waste from the river and its floodplain. "Plastic waste has become a global problem over the past few decades itself and has led to a crisis similar to climate change. Each initiative that is trying to improve this situation makes sense. PET Cup is one of the most creative national initiatives, which shows that together we can make a lot in a week,” said Alexa Antal of WWF-Hungary. PET Cup draws attention to the protection of rivers and proper waste management through sport, volunteering and environmental awareness. The event has evolved into an internationally significant project promoting environmental and nature conservation. The Pet Cup focuses attention on the enormous amount of PET bottles – sometimes reaching up to 1,000 tons – coming from across the borders, and makes clear that a huge amount of waste flows through Hungary – and a big part of it stays trapped here. Large plastic pieces injure, suffocate and often kill marine animals, including protected and endangered species. By entering the food chain, these fragments threaten an increasing number of animal species as well as human health. The Tisza, one of the main rivers of Central Europe, is the longest tributary of the Danube and its largest sub-basin. Originating in Ukraine, the river flows west, roughly following Ukraine's borders with Romania, Hungary and Serbia. The Tisza has a rich and varied wildlife with over 200 species of birds residing in the bird reserve of Tiszafured. The floodplains along the river boast a great variety of plant and animal life. Europe (EU-28, Norway and Switzerland) is the world’s second largest plastic producer after China. In 2016, it produced 60 million tons of plastic, generating 27 million tons of plastic waste. WWF is urging governments to adopt a legally-binding international agreement to eliminate plastic discharge into the oceans, supported by strong national targets to achieve 100 percent plastic waste that is recycled and reusable by 2030 and includes national bans on single-use plastic items such as bags. WWF's recycled boat "River Panda"